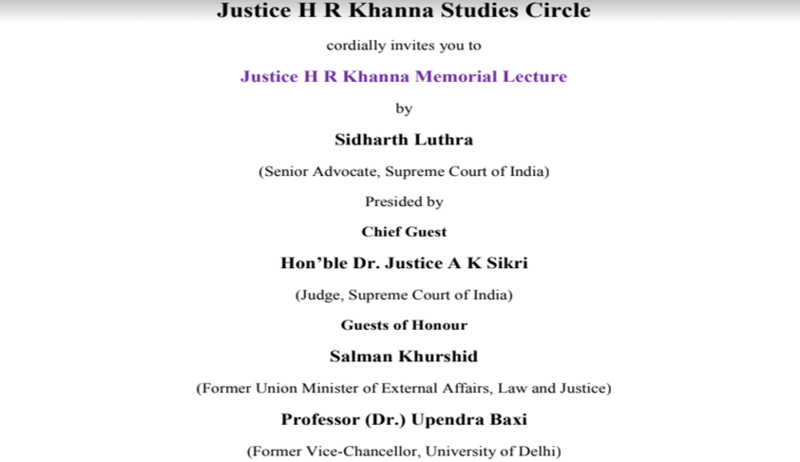 Justice H R Khanna Studies Circle is organising the Justice H R Khanna Memorial Lecture. The lecture will be delivered by Sidharth Luthra, Senior Advocate, Supreme Court of India. The Chief Guest for the event is Hon’ble Dr. Justice AK Sikri, Judge, Supreme Court of India. The Guests of Honour are Mr. Salman Khurshid, Former Union Minister of External Affairs, Law and Justice and Professor (Dr.) Upendra Baxi, Former Vice-Chancellor, University of Delhi. The lecture will be followed by high tea. The flyer for the lecture can be accessed here.